B rand new condition. Bought it in June 2018. Shoulders 19". Waist 20.5". Pit to pit: 21". Actual colors may vary. This is due to the fact that every computer monitor has a different capability to display colors and that everyone sees these colors differently. ANY IMPERFECTIONS WE WILL NOTE IN OUR PICTURES. Actual colors may vary. This is due to the fact that every computer monitor has a different capability to display colors and that everyone sees these colors differently. Length (top of the collar to hem). I have owned this jacket since new. Leather hook inside needs repair. Cloth pocket is torn at bottom but easily repaired. Size 42 on label. Shoulder to cuff 23". collar seam to hem seam 23". Schott Black Leather Jacket Mens Size 42 w/o zip-in liner. Condition is Pre-owned. Shipped with USPS Priority Mail. Back Collar seam to the bottom: 24-1/2 ". Vintage Schott 125 Leather Motorcycle Biker Jacket Size 44 NO RESERVE!!! Vintage Schott 125 Leather Motorcycle Biker Jacket Size 44. Black thick, soft and supple leather. In great shape with a nice vintage patina. There are a few nicks and scratches but nothing major. All zippers and snaps work as they should. A nice vintage Schott!!! Please see all pictures for best description and measurements. Feel free to ask any questions. NO RESERVE!!! Schott Leather Jacket Style #141 Fitted Size 42 Cafe Racer. Condition is Pre-owned. Shipped with USPS Priority Mail. Jacket is black and the liner included with jacket is a dark brown. This jacket is slim-fit. The jacket is in great condition aside from minor wear on the collar, which is shown in the pictures. Length (neck seam to bottom of jacket): 27". Sleeve length: 27". Body lining: 65% polyester/35%cotton. This Schott leather is well worn but no tears and everything is functional. And it has character. I paid $50 to have some of the previous repairs to the stitching professionally re-done. The liner is frayed at the end of the sleeves. I will combine shipping with the other leathers I'm selling. Sorry, no International shipping, lower 48 States only. Mens Native Schott Wyoming Buckskin Jacket with Fringe Size 42. Condition is Pre-owned. Shipped with USPS Priority Mail. It features two zipper pockets and sleeves and a heavy duty zipper closure. The leather is excellent with minor signs of wear. There is a small scratch/cut mark on back on left side that can be seen in the close up of picture # 6 and the last picture ,it is on the surface and does not go through the leather. Condition is Pre-owned. It isa great classic bomber, comparable to Canada Goose, Moose Knuckle, Moncler,Nigel Carbourne. This jacket is really distressed and looks very cool. Lining has been removed. Condition is Pre-owned. A few minor scuffs and scrapes as shown in pictures. All zippers are in functional working order. Schott Sz42 Brown Leather Jacket 184SM A-2 Cowhide Bomber Flight Jacket PilotNEW. Shipped with USPS Priority Mail. Nice and soft! Fully lined. 44" chest x 38" waist x 27" length x 25" sleeves. 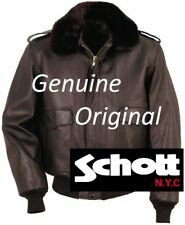 Pre-owned Men`s Schott NYC Nylon Flight Jacket Style 9725 MSRP$200. Condition 8.5/10. Shipped with USPS Priority Mail. I bought this motorcycle jacket new 40 years ago. Don't buy an imitation "distressed" leather jacket. Pretty good original condition for its age. Schott 141 Black Leather cafe racer Jacket Size 42 in great condition!! Schott 141 Black Leather cafe racer Jacket Size 42 in great condition!!. Condition is Pre-owned. Shipped with USPS Priority Mail. Schott Vintage cafe racer Black Leather Motorcycle Jacket pre owned ruff looking Men's L fits like today’s med schott logo on buttons and pockets great Condition minor work as in the pictures.Shipped with USPS Priority Mail. SCHOTT NYC Perfecto 519 Black Leather Biker Jacket Size Large L. Condition is New with tags. Shipped with UPS 3 Day Select. VTG 60s SCHOTT US B-15 A BOMBER JACKET Sz M MADE IN USA FLIGHT FLYER FLIGHT. Good vintage condition. Horsehide is lighter, lasts longer and is far more durable than cowhide. All solid brass hardware, very well made, heavy duty sippers. Great for riding or just wearing out. 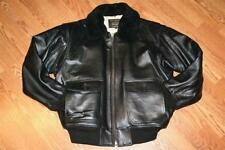 Schott Bros. Up for sale a beautiful flight jacket “9708” style,💯% original. Great quality, made in the USA. Size small. Wool/nylon with nylon lining and polyester fill. The jacket is size 40. Schott 118 size 54 in very good condition. I see no holes or tears in material. This is a nicely broken-in jacket with minor wear along cuff edges, belt, coin pocket, collar edge, etc. Not distressed but not new. Great Conditon zip out lining. MENS SIZE 42 SCHOTT JACKET!! CONDITION- PRE-OWNED!! GREAT CONDITION!! NO RIPS, HOLES OR STAINS!! FREE SHIPPING!! PLEASE SEE ALL PICTURES AND ASK ANY QUESTIONS! !